I may not do this every month, but I had enough new ‘favorite’ things in August to justify a post about it. So here it goes! So anyone that’s been following my blog for the past few weeks know my birthday was in August (the 25th!). Not that being a mom takes away some of the celebration- but it’s easy to forget about stuff like that and let yourself get overshadowed by the kiddos. Celebrating with you all, and with my husband and family, was lots of fun 🙂 So that leads me to one of my first favorites: my new cellphone cover! Technically I got this in September- but it was a birthday present from my in-laws, we were just unable to celebrate on my birthday weekend due to my kids being sick. So I’m still counting it! This particular one came from Insomniac Arts, and can be found here. Moving on to more beauty related items, my new favorite thing ever is Duri Rejuvacoat! Really, I feel like this little bottle is a miracle worker. I’m using a stock photo, because my bottle is 1/2 empty now. I’ve talked at length in the past about how my nails have never been able to grow- they’ve always been thin, they break easily, and grow slowly. 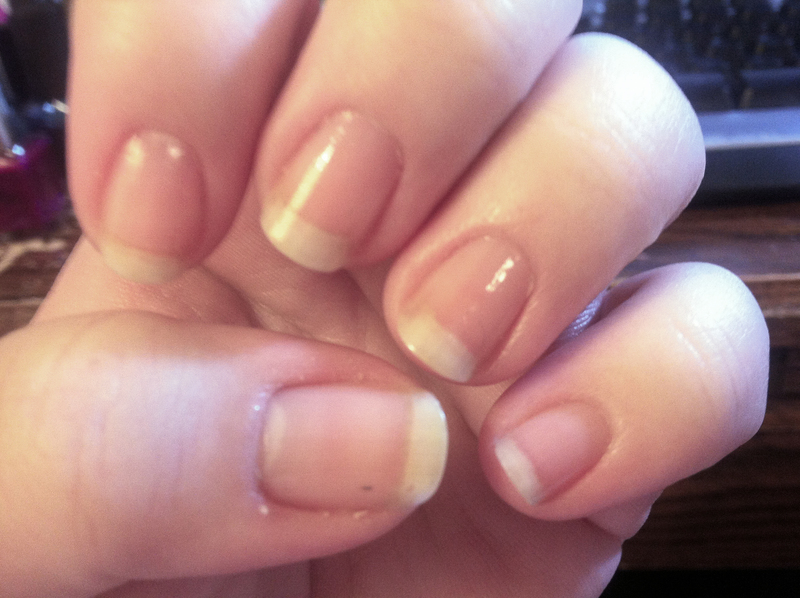 I was also recovering from a nasty set of acrylics I got back in April- it took until this month to slowly grow out all the damage, and that whole time my nails were paper thin. Not anymore! This is a picture I took with my phone tonight. My nails look better than I have ever seen them. Now, part of this is because I’m taking better care of them all around- but a lot is because of Rejuvacoat. This is 2 weeks growth, ya’ll- and I have banged them up and done plenty of things that would have normally broken one, and they’re still doing well! I did have a small break on my right hand, but it wasn’t bad. My nails are SO strong compared to just a month ago, it’s unreal. 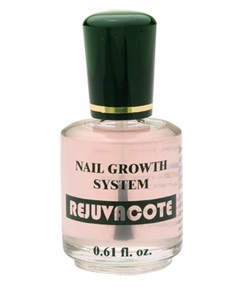 So if you have issues with your nails, I highly recommend giving this a try! I bought mine on Amazon, but you can find it on their site, and it’s also sold by Ninja Polish. This month was when I finally managed to get my hands on some of the new Essence bottles. I am in love with these new bottles! The brushes are more similar to OPI’s, which I love- and I also love all the new colors. The ones I have so far, left to right, are: Gorgeous Bling Bling, Party Princess (yes, it’s another I Lily Love You dupe, but the flakes aren’t as big and almost not noticeable), Oh My Glitter!, Grey-T To Be Here, Date In The Moonlight, and Chic Reloaded. Moving away from nails for a minute- I also have been in LOVE with my Lilac Lotion from KBShimmer! I shook the bottle before the photo- the usage is down to the top of the label. I use the lotion multiple times a day- I adore it. 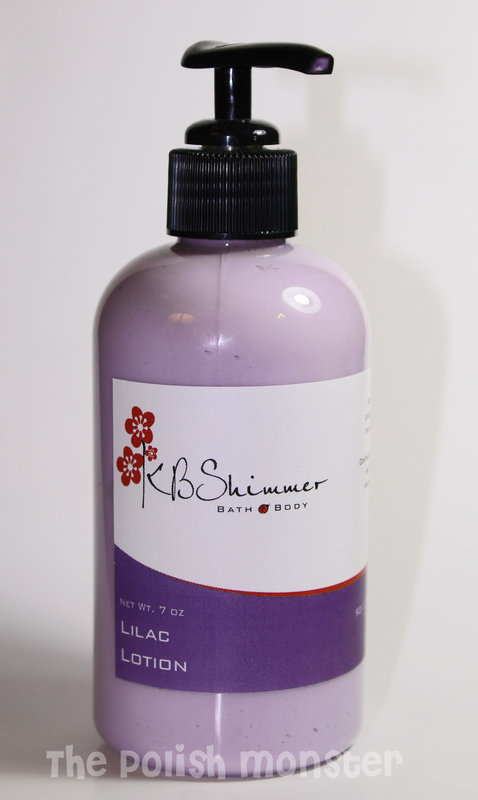 My very favorite scent is lilac, and it’s been hard sometimes finding lilac scented body products. This one goes on smoothly, absorbs in quickly, and isn’t greasy. And is smells awesome! The next time you grab some of Christy’s awesome polishes, be sure to get some of her other products as well- they’re amazing! You can get them at her store here. Next up, is something most people knew about, but I had never heard of- purple shampoo. While not a natural light blonde (I’m normally dark blonde/light brown), I’ve always dyed my hair lighter. And it always goes brassy and yellow, every single time (I use a light ash blonde color). I’m cool toned- brassy just doesn’t look good on me. 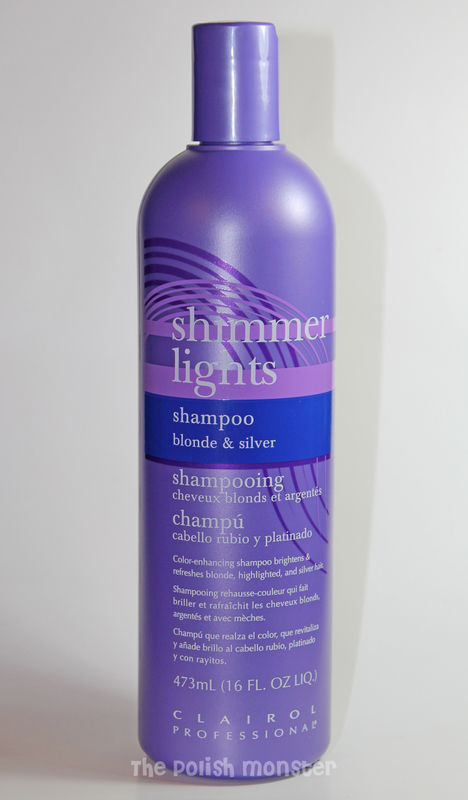 Purple shampoo, like Shimmer Lights, removes brasiness and restores brightness to blonde/silver hair. After using this one time- I could tell a huge difference. Of course I also experienced the flip side of that- using it too much and almost losing color completely in some areas 😉 But overall, this has been a lifesaver for my hair color. I bought this one at Sally’s Beauty Supply for just over $8 with my Sally’s card. August was the month I squashed 3 out of my 4 biggest lemmings! 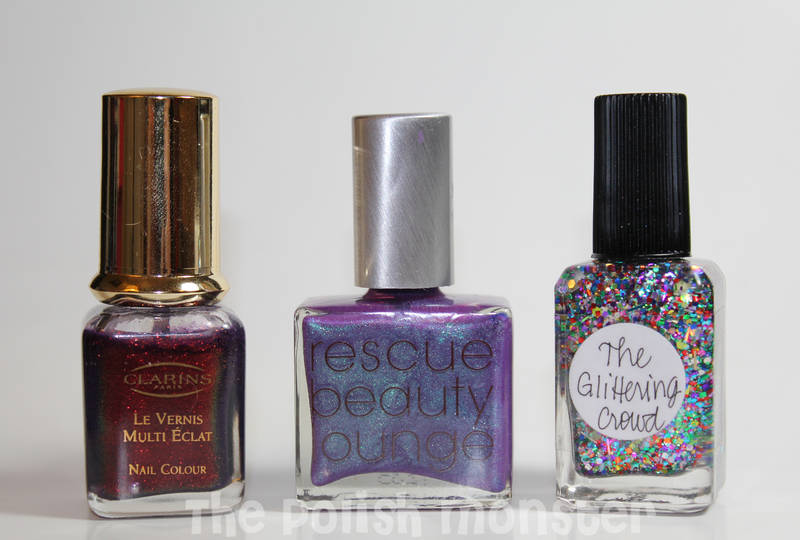 From Left to Right: Clarins 230, Rescue Beauty Lounge Scrangie, and Lynnderella The Glittering Crowd. I can’t wait to see what new things I find in September- I’m LOVING the new fall scents and colors coming out! This entry was posted on September 5, 2012 by The Polish Monster. It was filed under Uncategorized . Oh good idea, thanks! Before very recently I just used the store boxes, but I’ve wanted to start using the ones from Sally’s. In the store the ‘regular blonde’ ones were super yellow/brassy on me, and before I found Shimmer Lights doing Ash Blonde was the only way to counteract it- or try to 🙂 I’ll give those a try next time- my roots are coming in really badly right now anyways! Well Viva la August! Your nails look GREAT, and you got 3 amazingly awesome polishes, in knocking out those lemmings! Congrats! I hope September goes just as well! Good move on the purple shampoo!! You also might want to try the Avon Radiant Silver shampoo, it is the best I’ve ever tried and I think I’ve tried them all!!! I’m always happy to hear when a good, long, often wished for and just out of reach lemming is good and squashed. Good choices for lemmings, too. Happy birthday-month-celebration. I’ll be remembering you from now on, since my daughter’s birthday is the same day! Thanks guys! And I’ll keep that in mind, Peita! So far this is the only purple one I’ve tried- I’ll get the Avon next! Thanks so much for the shout out! 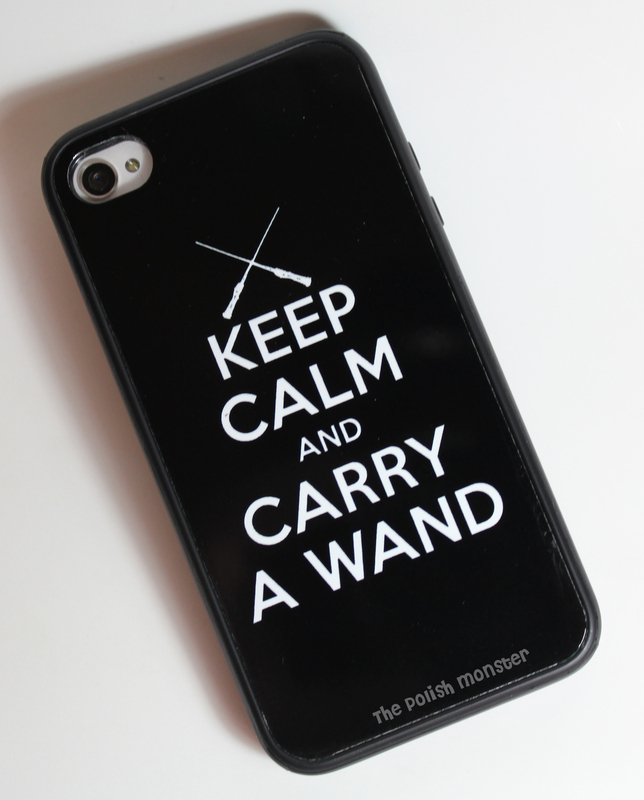 So glad you like your new iPhone case!